All Windows operating system since Windows Vista and all Windows Server operating system since Windows NT 4.0 comes included with built-in Internet Information Services (IIS) Server, which is not installed and not enabled by default. The version of IIS web server that is released is different by version of Windows and Windows Server, which is summarized in the table below. For administrators need a web server for a small workgroup, ASP.NET developers that need a testing environment for ASP websites, or bloggers want a simple web host to publish their opinions, the free IIS Server in Windows provides instant and basic web server functionalities which include the WWW, FTP, NNTP, and SMTP services (may be less or more depending on edition of Windows). In fact, newer IIS is now very stable, reliable and capable of handling heavy traffic websites. Comparing with old version of IIS such as IIS 6, newer components are selected for install in newer version of IIS than were installed in IIS 6 in default selection, thus users may want to manually enable some additional features. One example is IIS 6 comparability feature that not selected to install and enable by default, which is required to use ADSI scripts. In Windows Vista and Windows 7, click on Start button, then open Control Panel, then click on Programs link. In Windows 8, Windows 8.1 and Windows 10, open Power User Quick Access menu and select Control Panel, then go to Programs. If prompted, allow UAC (User Account Control) permission to continue. 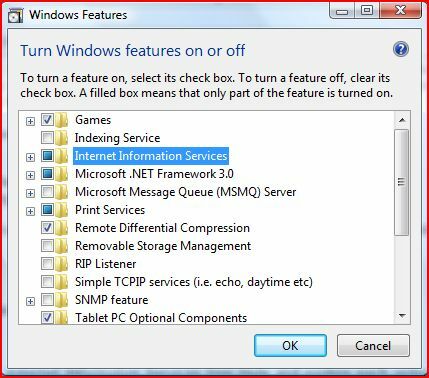 As mentioned above, you might want to expand the Internet Information Services tree node and explore each options available, as some advanced settings are not enabled even thought you have installed IIS. Such functions include FTP Server, IIS Management Console, ASP, ASP.NET, CGI, ISAPI, Server Side Includes Application Development Features, Directory Browsing, HTTP Errors, HTTP Redirection, WebDAV Publishing, Custom Logging and etc. Click OK. 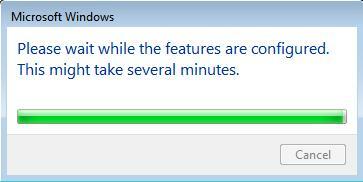 Wait as the installation of IIS may take a while as seen in the dialog box. Once installation of IIS is done, the web server is running on the Windows system without any further configuration. You can check the functionality of the new web server by pointing to http://localhost/ from any web browser or surfing to the computer name within local area network (LAN), where you should see a IIS default page. To make the web server accessible from Internet, you will have to configure your router and DNS services.